Here is the first of the Reader Requested Short week. This is a request asking how some of the background kids that were adopted are doing. I thought right away of Mark and Martina, but while looking through the archives I also remembered the polygamous quintet that considered adopting Amanda before a… terse disagreement got them a Disturbing the Peace write-up. Thursday’s short is a brief visit back to the snobby shoe store C’est la Feet, and I haven’t done a Sketch Day Saturday in a while, so come in on Saturday this week for a silly sketch of Jessie and her girlfriend Alexis. *I don’t have or know anyone with claustrophobia, so my only resource for it is Wikipedia. Hopefully I’m not TOO off in my thinking that trying to give Martina’s living space a sense of openness and expansiveness would help with her phobia. 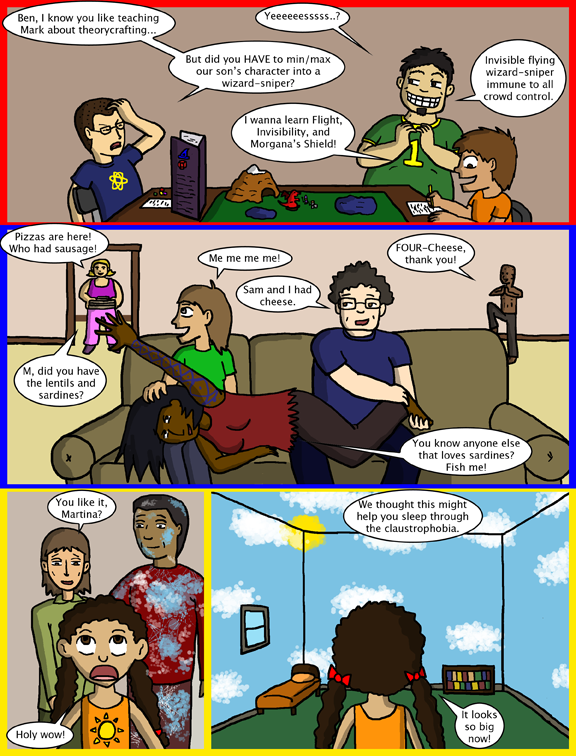 At some point years in the past, I conceived of a comic strip idea featuring college-attending housemates. I never got it off the ground but the characters still pop in my head from time to time. I decided to use them for the polygamous quintet. Their names are Tarah (holding the pizzas), Sammy (Doing tai chi in the corner), and Corwynn and Brad have Maven on their laps. Hey, if the filler’s going to be this good/adorable, take your time. Real life happens to the best of us sometimes. Meaning I have never read it. They might add one of those miniature star projectors for the girl’s room as a night light. LOL, for a while I was having trouble interpreting “Fish me!” as anything but “the version of me who is a fish” (i.e., that’s who likes sardines). I’m seeing a League of Legends reference there, with Morgana’s Shield giving crowd-control immunity. Oh, I’m aware of it being a tabletop RPG. I’m just thinking that the skill Morgana’s Shield is a nod towards the League of Legends champion Morgana, who has a skill called Black Shield that blocks magic damage and grants immunity to crowd control. And though I don’t play her, I’m guessing Dave’s comment below is one of Morgana’s quotes, confirming my thoughts. Yep it’s a League of Legends nod, alright. I loves me some Morgana. lol. One’s name is Tarah and my posting name is Terah. I love coincidences. Totally have to love the five parent’s crew. Dave you should add me on League. Username is same as my comment name! My summoner handle is Strawberrycocoa. A commune? They were popular round this way in the 80s (and in the 60s, I’m told). Wait? They got into this huge fight where the police had to be involved. They were arrested in the orphanage… and they still were allowed to adopt a child. Seriously? No, they haven’t adopted anyone. I’m not exactly prone to claustrophobia, but I have a very small apartment, made smaller still by furniture. My walls and ceiling are light blue and the floor is covered with dark wood -mockup plastic carpet. For me at least that works to make the space feel bigger, so I find it entirely plausible that it’d work for Martina. It looks like our polyamourous quad adopted an older child. Good on them. But, er… which one is the adoptee? The one in green who eats plain pepperoni? No, that’s one of the quints. The one in green is just small-framed. No, all 5 members of the quintet are adults. They were arrested before they could adopt anyone. Apparently I was not the only one that thought this was a “strip” about one LARGE family, instead of three separate frames about three separate families. It was confusing, for a while. Helped along, I think, by the woman in the bottom frame resembling the “me, me, me” guy in the middle frame. Doesn’t look identical, but could be all stressed and tired from painting. Having the panel frames be in different colors for each part of the strip helps a lot. Great idea, Dave! Hey Dave, you totally messed with my head on this one! I read all my comics in various tabs at once, and that first panel had me wondering why Weregeek had a guest artist for way longer than it should have! Aww, the one for Martina was adorable. As for the legitimacy of the solution, I’m sure it could be very effective for a young child! It may not be realistic and so probably wouldn’t help an adult or older child, but at her age I expect her imagination would fill the rest in and expand the space in her mind. In my head, the voice of Dad on the right in the first panel has a weird mix of the “Yeeeesssss?” guy and Mr. Burns (both of The Simpsons, in case that wasn’t clear). Wow. When I was a kid I was stuck in bed/wheelchair for two year over a series of surgeries. My parents painted my room exactly like that so I wouldn’t feel so cooped up. We used a dabbing motion with a natural sea sponge to get the “puffy” feel of the clouds. I dont care if this is the only page he will ever apear in, Ben is my new favorite character in this comic! is her sun shirt a homestuck reference? Sorry, I never got into Homestuck. Just thought she’d be a sunshine kind of kid. lol, the shirt actually reminded me of digimon…. looked like the crest of courage to me. I had a sibling who did that sort of paint job well in her 20’s so the room would feel like a garden. I think it would work just fine. Is it sad that my first thought was that Morgana’s Black Shield is actually on the weaker end of things tabletop wizards can do? Hold it, Black Shield of LoL is a nod towards D&D? Or are you just thinking a little more generally? You could make the argument that Black Shield is a Globe of Invulnerability type effect, but was just thinking generally. ..and I realized that’s the exact reason no one has wanted Amanda. It’s Dave’s fault. He made Amanda be an unloved unwanted child, he put her through all this emotional torment, for the sake of his story. Why doesn’t anyone want you, Amanda? It’s because Dave said they weren’t allowed to. You’ve created characters real enough that I’m thinking of them as distinct from you, Dave. Good work.